Fort Mojave is located on the Colorado River, at the western edge of Arizona. Bordered on the west by the states of Nevada and California, and on the east by the Black Mountains of Arizona, it is located in what is generally referred to as the low desert, an area of warmth and sun, low relative humidity and scant rainfall. This virtually smog-free, dry and hot climate creates a very desirable environment for the residents of the area. The Town of Golden Shores, population about 3,000, sets just North of Interstate 40 along the western edge of northwest Arizona. Nestled against the Colorado River, it has merged with another small nearby town of Topock. Snowbirds escape the cold winters and enjoy the mild climate, clear skies and the natural beauty. 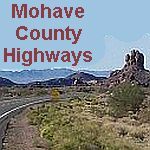 In 1963, on the Mohave County courthouse steps in Kingman, Arizona, the town's founder, Robert P. McCullock, Sr. purchased a 26 square mile parcel of barren desert, that would become the site for Lake Havasu City. At the time it was the largest single tract of state land ever sold in Arizona, and the cost per acre was under $75. Laughlin is at the upper end of the Mohave Valley. It is a great vacation spot attracting over 5 million visitors annually to it's 9 major hotels and casinos, with over 10,000 rooms and top name entertainment. Nestled in the picturesque Mojave Desert along the cool gently sloping banks of the Colorado River at 504 feet above sea level, it is set in a rugged mountain terrain. It provides easy access to some of the nations most scenic areas and sites. The area is a playground for hikers, boaters, skiers, fisherman, campers, swimmers, golfers, and overall outdoor enthusiasts. There are also abundant golf courses, spas, and even a wedding chapel.